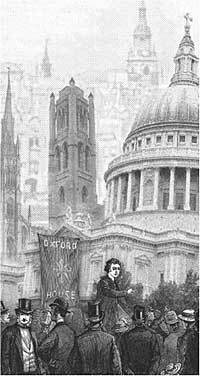 Schools providing education for the poor played an important part in the mission of the Church of England and other churches in Victorian London. Bishops, clergy and leading lay people regarded a school for the children of the poor as an indispensible element in parish life, and bishop Blomfield of London (1828-1856) suggested that a school should precede a church when a new parish was being established in a working class area. The primary purpose of these schools was to teach children about the Christian faith. This would help to make them good citizens, and to teach them to read, so that they could read the Bible and the Prayer Book for themselves, and to write and reckon, i.e. do simple arithmetic, so that they would become useful citizens, able to contribute to society. 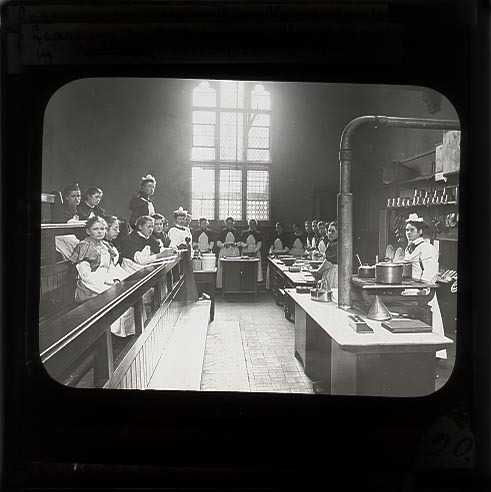 Schools are a significantly under-researched aspect of life in Victorian London, and so to investigate the history of a school may be to break new ground. 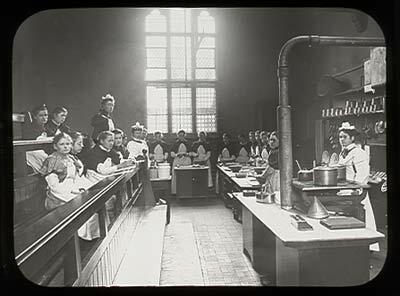 A glass lantern slide of a National School’s cookery class (Image courtesy of the Trustees of Lambeth Palace Library). A starting point for the history of a school, and especially a church school, is the building itself. If the school is now a modern building the original building may be nearby and now be used as a church hall. When was it built? Is there a date or foundation stone, and what does it say? Does it refer to a grant from the National Society, or describe the school as a ‘ National School '? What is the location of the school? Is it near, or perhaps on the same site as, the church and the vicarage? What is the architectural style of the building? Is it like any other local buildings? Does it remind you of anything? Can you tell how many rooms were in the original building? What do you think is the significance of that? Are there any inscriptions, perhaps over doorways that throw light on how the buildings or rooms were used? Have there been extensions or internal rearrangements, or rebuilding, and if so, are there clues as to when and why, for example additional date stones or wall tablets? How does the school relate to its context? Is/was it a focal point for a local community or neighbourhood? Does it look as though there have been a lot of changes in the local neighbourhood? If so, what is their significance for the school?? Is there a display or photographs of the school, perhaps in the entrance or elsewhere. What does that tell you about the school and the pupils and teachers? Are there any memorial tablets to teachers in the school in the church? A school building is the starting point for research about a school in the context of its parish and the life of a local community, although often the older the origins of a school, the more likely it is to now be situated in a replacement building. Talking to older members of a congregation - or members of an older persons' lunch club, if there is one in the church hall or a local community or drop-in-centre - may be a good starting point. The pattern of usage of some schools, especially smaller church schools may have been quite conservative, so people who were at the school in the 1940s may have had a similar experience to their parents, and even grandparents. People may remember stories that their grandparents were told by their parents or grandparent, which you may be able to check against written records at some stage. In some parts of London, even areas that have been extensively redeveloped, a surprising number of older people may have long-standing local roots. Despite the importance of schools in religious life in the nineteenth century and the controversies about approaches to education by the churches, not much has been written about education and schools, especially about local experiences. Find out more about books on schools. The first steps in research are to look at the buildings and to listen to people who may have memories of the school in the past, this will help you to begin to develop some ideas. You then need to test out your ideas by doing some research among documents that may survive in relation to the school. Looking at the buildings and listening to people may help you to understand the documents better, and looking at documents may raise more questions about what you have seen and heard. See here for more advice on research.